Hello 1977. This is Your Kitchen Calling. I found proof. Old photos that I’ve scanned, making their presence on the blog grainy, but proof still of the kitchen I told you all about. Here’s a photo of the night I had a Housewarming Party and wow, from the looks of all the booze piled on the counter, the guests had a pretty good time, especially considering afterwards they had to navigate the winding roads back to the Chappy Ferry, home to Edgartown or beyond. Note my cool giant KHL [corrected by Cobra, thanks to KLH] speakers! The third photo must have been taken much later – the fridge is covered in photos, out of focus, sorry, but it gives you a good sense of the place. I loved this house, bought for $60k, with maybe close to $60k into it make it winterized (ie adding heat since it was a summer cottage when I bought it), and I added a second story – there was already a screened porch but I redid it. Downstairs, the house had a big living room, a nice dining room, two bedrooms, one I used as a TV room/den, one a guest room, a full bathroom, then the master bedroom and bath were the only things on the second floor, with a killer view of the ocean. The stackable washer and dryer were behind the doors next to the fridge. I had everything I needed. Now I look at this house and I see timeless. It doesn’t seem terribly 1977 to my eyes. No avocado appliances. Yes, no one uses faux butcher block anymore and when I watch HGTV House Hunters, shoppers are aghast at something like a red sink and no one wants melamine cabinets, but for a gal on a budget, I was pretty happy camper. Life was so good. On my own, like Mary Tyler Moore, meeting and making some of the best friends of my lifetime, my own home – darn. Lucky me. Looking up in the sky this morning, expecting doom and gloom from José as was forecasted, all I see is bright blue skies, not a drop of rain – and based on the forecast, I postponed my trip to Wilmington. Win some. Lose some. Happy Tuesday one and all. Anyone else have a kitchen like this in the 70s? Nice kitchen! KLH…I had the same or similar “all in one” unit back in the late ’60’s. Served me well for many years but finally expired and went to the dumpster. Mine are in some dumpster too. They got damp in some place I had them and ruined them forever. Good memories, eh? I’d live in that kitchen (and house) today. looks wonderful to me, fake butcher block and all. Two thumbs up. Wish I knew you then to go to your parties. A real Perle Mesta you were. Nice to know someone else around here is old enough to know who Perle Mesta was. Thanks. I, too had the red Koehler sink. My kitchen, though, not so timeless. It was 1970 & the bi-centennial was looming. For the first & last time I went with something trendy – navy suede Formica cabinets, white counters & appliances, red, white & blue vinyl floor, red wainscoting & red & white ticking wallpaper. I still can’t believe I chose that stuff but I sure did love the sink! Just to keep it all going I got a navy sink in the powder room with YUGE red & white paisley wallpaper. We sold the house in 1976 so undoing that mess was someone else’s headache. I feel I should stand and applaud! Red white and blue. Please tell me you have photos somewhere. Please. I think it sounds awesome. What is “navy suede” Formica. I don’t know that term. Did the cabinets look like suede? There isn’t one person I know who doesn’t look back at some aspect of design- home design or personal design and day whoa (as in the GIANT glasses I chose in the 1980s or the dresses with shoulder pads!) but we all made those decisions loving it at the time, so I says it’s not a mistake at all. Sorry – no pictures. The Formica actually did look a little like suede. It had a matte finish & was ( I think) the only alternative to the shiny stuff that was available at the time. Oh my. I would have loved to see pix. Navy blue cabinets are all the rage now. Lowers with uppers white. So see, you were ahead of your time! Your thoughts, adventures, dreams and reminiscences today were appetizing as always. “Medicare For All” Is No Miracle Cure. Thanks LJ, I’ll go look. I watched only some of Trump’s UN speech, was on the phone (someone called me and I couldn’t not answer and gab) so I’m still playing catch-up on how his speech was received, then I’ll go look at Bernie’s Bennies4All plan. I did hear Trump say something about socialism not working anywhere it’s established, so that was a direct knock at Bernie’s plan I figure. Trump UN speech getting heralded by many, even ROMNEY! Gingrich’s comment is fairly typical of the good ones. President Trump's United Nations speech is historic and sets a new standard. Sovereignty and national interest are reasserted as principles. I thought it was strong and reiterated his election tagline that he wants to make America great again. A real stereo set up! One of my first moneymaking ventures in the Navy was on stereo equipment. Academy roommate’s dad was an AF big wig who was base commander at Clark AFB in the Philippines. Because he had an Asian PO address, he could order Japanese electronic equipment through the PX at rock bottom prices. We would send him a list, he would order it, then stick it all on a cargo flight to Andrews or Bolling. We would go pick it up and skim 60% of the difference between the Asian PX price and the US PX price for our trouble. A real hustler, eh? Nothing wrong with making a good honest buck, or ten. Kudos. Between that and tripling my bankroll as a money lender on board my ship during a summer cruise, I soon realized that my true calling lied somewhere else…. Hence, your handle Mr. 85 Broad! Way to go. You’re right – pretty timeless in the best sense of the word. The only possible giveaway is the rounded edge of the counter. I’m pretty sure I’ve mentioned here that I still have my father’s old Sony (circa 1964+/-) Reel to Reel player and ALL his tapes. My dad was KING of the stereo and electronic equipment – he always bought the newest and best toys for the house. Lord, I can remember being the only house with color TV, and the only house with like FOUR TVs in the house. 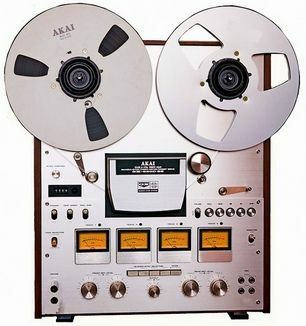 I was forbidden from using the reel-to-reel, but in true EOS The Imp Daughter self, I did use it, got caught because I didn’t put the tape back exactly how dad would have, and got banished from using it again. I couldn’t blame my sister because (a) she always followed the rules so dad knew it wouldn’t have been her and (b) she was already off at college, leaving me holding the Guilty bag. Oops. ← How did they Know I Needed this?